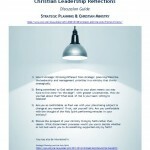 I’ve just finished writing a workshop called A Christian Perspective on Strategy Development. While writing it, I had a thought: Jesus, the ultimate leader, didn’t write a strategic plan for his disciples. I wondered, what might a strategic plan have looked like if the apostles had felt they needed to write one? Let’s speculate with a “What if…” scenario. If this were a TV show, your screen would now mist over as you enter an alternate world and find yourself in Jerusalem the day after Pentecost. As the mist clears, we see the apostles holding a strategic retreat. As you watch events unfold, you notice a twist. They interpret their mission as taking the gospel to the Jews wherever they have settled, even to the uttermost ends of the world. Since the prophets repeatedly said that God’s promise to bless the nations will be fulfilled by the nations coming to Jerusalem, and not by Israel going to the nations, it simply is not in their minds to initiate a mission to the Gentiles, and in fact, they explicitly reject that possibility and put it in their plan as a guiding policy that they will follow the current Jewish practice of receiving Gentile converts but not looking for them. The SWOT analysis starts off well enough, but in this alternate world the apostles get bogged down in the Weakness and Threat categories. As the chair, Peter tests for a consensus. “It sounds like we are agreed then that we’ll take a go-slow approach and build capacity before rolling out to the public. We need to do some recruiting to our ranks, some training and some coalition building before the public phase.” Hearing no opposition, he suggests they move on to develop a strategy for the public phase so they are ready for it when it is the right time. This was a short discussion as they decide, due to quality control concerns, that only the apostles should present the Gospel to anyone. People speaking to family, friends and workmates would not be allowed to present the Gospel message, but would invite people to one of the mass evangelism events instead. At this point, your screen mists over again and you are back in the real world where everything is once more as it should be. “Phew!” you say to yourself, “that was a fun diversion, but I’m sure glad that’s not what they did!” And you flip open your Bible to read again about the Lord of all creation who has called you into ministry to serve his purpose using his resources, and who goes before you and behind you. You appreciate anew the power of the Holy Spirit who equips you and who works in the hearts of people, calling them to their Creator. You feel a fresh affinity for Paul, who in his own weakness relied on God’s strength and turned the world’s order upside-down through the foolishness of the Gospel. You’re glad Peter set aside his own notions about the mission and went to see Cornelius when God told him to go. Does this mean that strategic planning is a no-no? Not at all. Preparation, planning and training are good practices. Just be careful that, like everything else you do in your ministry, they support your mission and your identity as a Christian organization. The problem with traditional strategic planning is that the plan can easily become the master instead of the servant. It can easily restrict God’s ability to be God and do fresh things today because once we have a plan we can become too attached to it. Worse, strategic plans become straitjackets when performance evaluations are based on them. This is why I prefer to talk about strategic thinking or strategic management rather than strategic planning. I see it as a way of leading as opposed to a periodic task. There is a place for going through a specific strategy development process, one in which you give much more time to plumbing the depths of strategy, and in which you invest extra time in more thorough research than usual. But the tools and techniques you use should go beyond objective analysis and leave room for subjective analysis, spiritual reflection and group discernment. I’d love to hear any stories or thoughts you have related to developing strategy for a Christian ministry. Great thoughts, John. You said, “Worse, strategic plans become straitjackets when performance evaluations are based on them.” Not necessarily sure this is as forthright as you state. Appreciate the idea though. Thanks. It is a provocative statement for sure! As long as the employee and the manager are both willing to judge performance on the basis of the plan as it may change through the year, then it should be okay. The annual action plan can change at any moment without in any way affecting the way the staff are evaluated.